National Nutrition week is celebrated every year between September 1 to 7. The theme of National Nutrition week 2015 is 'Better Nutrition: Key to Development'. The main aim of this campaign is to create awareness on the importance of nutrition for health, which has far reaching implications on development, productivity, economic growth, and ultimately national development. One out of three of the world's malnourished children live in India. Malnutrition has adverse effects on human health and development. It also results in loss of productivity and economic backwardness. As a result, The Women and Child Development Ministry has decided to intensify its efforts in battling malnourishment amongst children. Nutrition is a focal point of health and well being. It allows you to be strong, provides you with the energy to perform, and makes you look and feel good. Nutrition is an issue of survival, health and development for current and succeeding generations. Eating right is not merely meant for people who want to lose weight or want to get back in shape, it should be incorporated into everyone's lifestyle to keep diseases at bay and stay fit. As the saying goes, "you are what you eat". Your food choices each day affect your health— how you feel today, tomorrow, and in the future. Good nutrition is an important part of leading a healthy lifestyle. Combined with physical activity, your diet can help you to reach and maintain a healthy weight, reduce your risk of chronic diseases (like heart disease and cancer), and promote your overall health. Like a finely tuned racing car, your body needs the right fuel (food) and regular maintenance (exercise, lifestyle and mental attitude) to achieve its true health potential. Nothing is more important than healthy eating! Put in the wrong fuel or let it go without regular use and there's no way it can deliver its full power and performance. Without healthy eating, your body's engine will cough, splutter and eventually stall. What are the elements of a Healthy Diet? 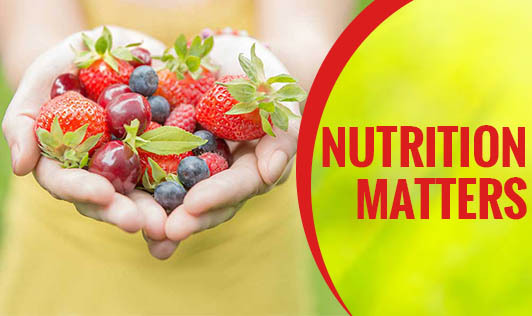 Food is made up of specific nutrients - proteins, carbohydrates, fats, vitamins, minerals and water- all of which are necessary for life, growth, body function, and tissue repair. Are cooking oils good for the health? No single oil can do the job. It is always recommended to use a combination of oils either blended or by rotation, such as groundnut oil, soya bean oil, sunflower oil, and rice bran oil, so that you get the benefits of all. Why is breast milk considered as the single most important food for infants? Breast milk contains adequate amounts of proteins, fats, calories, lactose, vitamins, iron, minerals, water, and enzymes. It also boosts the immunity of the baby, which further protects the baby from several infections. It is quick and easy to digest. Individuals following a vegan diet can readily meet their vitamin B12 intake with a common, daily multivitamin or fortified foods, such as vitamin B12-fortified breakfast cereals, soymilk, meat analogues, and nutritional yeast. Both short-term and long-term, the most effective weight loss comes from avoiding animal products and consuming fats, vegetable oils, and highly processed foods to a minimum. In addition, it helps to keep the natural fiber in the foods you eat. This means eating whole-grain breads instead of white bread, brown rice instead of white rice, and plenty of fruits, vegetables, and legumes- such as beans, peas, and lentils. And don’t forget the importance of physical activity for achieving and maintaining healthy weight. Carbohydrate-rich foods help with permanent weight control because they contain less than half the calories of fat, which means that replacing fatty foods with complex carbohydrates automatically cuts calories. It’s important to remember to eat healthful carbohydrates, such as whole grains, pasta, brown rice, and sweet potatoes. Processed carbohydrates, such as white bread and white rice, are not as healthful because they have lost most of their fiber and other nutrients. Is it possible to lower blood pressure with diet? If so, how? Changing the way you eat can often lower your blood pressure and reduce or eliminate the need for medication. You can also lower your blood pressure by losing weight, limiting alcohol, avoiding tobacco, and becoming physically active. Small amount of weight loss achieved in a healthful manner is most beneficial. Losing as little as 5% of body weight can help improve blood pressure, cholesterol levels, fasting blood sugar, and blood triglycerides. Being overweight increases the risk for many chronic diseases, and losing small amounts of weight can improve your health and slowly help you reach a healthier weight. It is best to make small changes to eating and physical activity patterns that can be sustained over time and which will slowly help you lose weight permanently.